Jesus’ Gospel of God’s Love presents a fresh, non-traditional look at the Bible and Christian orthodox teachings. It explores the history and nature of the Bible and the development of Christianity, nature of God, nature of humanity, the after-life, and the way to salvation. If the concepts presented in the book resonate with you, you have an exciting spiritual journey before you, and a glorious destiny to work toward. For a preview of the book and purchase information, click on the image or go to Amazon. See http://www.amazon.com/Eva-Peck/e/B00DH68WPE for the author’s other books. Australian readers may find a better value for Jesus’ Gospel of God’s Love at Fishpond which sells discounted books and delivers them postage-free. Also downloadable as a free ebook in PDF format from the author’s website. If you wish to learn more after reading Jesus’ Gospel of God’s Love, go to my website, Universal Spirituality. Jesus’ Gospel of God’s Love is the book I’ve been looking for to share with my Christian friends who are devout students of the Bible. My favorite chapter is Jesus’ Life and Message of Salvation as my soul soared with inspiration in the greatness of Jesus’ mission on earth as I read it. Eva’s balanced, non-denominational understanding is supported by scripture references. Her invitation to experience the silence, stillness and simplicity speaks to me, as does her provoking description of how each individual soul is in a battle between sin and righteousness. Overcoming one’s sins and the way to purifying one’s soul, finding the greatest Gift of God’s Divine Love as Eva has done, is for me, THE most important story worth telling in this world! Eva has done a superb job in describing that the way to personal salvation is through the mighty blessing of receiving the Divine Love, rather than by the vicarious atonement through Jesus’ death on the cross. Eva Peck has given us a gift with her book Jesus’ Gospel of God’s Love. In this articulate, elegantly written book, Eva highlights the central message of the historical Jesus. She draws on her rich life experiences and her familiarity with many faith traditions and diverse cultures to contextualize the teachings of the Bible in ways that respect its value in transforming the consciousness of many, while recognizing its limitations. Her scholarship allows her to make a clear, seamless argument which reveals that Jesus’ ultimate revelation and central teaching is that of God’s Love as the way to salvation, the path to God’s Kingdom and at-onement with Him. She answers many key spiritual questions and links the principles of quantum physics with spiritual beliefs, showing the compatibility of science with theology. Her book is a great resource both to students of the Bible and those who, like myself, are unfamiliar with its teachings. Her clarity and ease of expression are evidence of Eva’s depth of understanding of the subject material. In this book, she shares with us the insights made possible by the spiritual maturity of her own soul. I highly recommend this book! Finally there is a book that helps me understand the discrepancies found in the Bible and how to deal with that in my own spiritual journey. In Jesus’ Gospel of God’s Love, the author beautifully describes her spiritual journey as it relates to the Bible and shows how some Bible teachings simply do not make sense when taking into consideration the beliefs of the Hebrew people during the time of Jesus. Furthermore, the author clearly shows that the Bible still contains many wonderful truths which have helped so many people develop a relationship with God. I highly recommend this book to anyone who would like an enlightened understanding of the origin of the Bible and the spiritual treasures that it contains. Jesus’ Gospel of God’s Love is an important document rich in truth. It takes the reader incrementally through a journey of understanding the fundamental concepts which are the building blocks to understanding what Divine Love is. The author does so by effectively weaving biblical and scientific understanding with revelations in the Padgett materials so as to present a viable and comprehensive study of spiritual truth. It is beautifully written and thoughtfully presented. I would heartily recommend this book to anyone be they Christian or otherwise. It presents a powerful alternative to orthodox and outdated Christian thought. It’s a firecracker of a book, bound to open the eyes of the most conservative thinker on the subject. 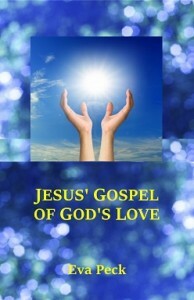 Eva Peck has given the world a gift with the book Jesus’ Gospel of God’s Love. Ms. Peck is a master of biblical knowledge and she puts this knowledge to perfect use as she shows us how important divine revelations received 100 years ago align very well with quotations direct from Scripture. Are there two spiritual paths being presented in the Bible? Is one correct and the other incorrect? Eva Peck discusses these questions, biblical history, and many other spiritual matters in this informative book about Divine Love, Jesus Christ, the Holy Bible and human destiny. If you’re searching for more meaning in your life and a fresh perspective of the Bible, you have found the right book. Eva Peck, with her in-depth knowledge of the Bible and biblical history, will guide you to a hidden treasure that runs through the Bible like a golden thread; hidden but not so to the curious and open minded searcher. This treasure is the greatest gift offered by God in all of His creation. It is His Divine Love. Eva explains how and why this knowledge was hidden after Jesus Christ revealed it to his disciples over 2000 years ago. Seek and you shall find, knock and the door will be opened. With each turn of the page, Eva opens the door a little more and will set you upon a spiritual journey unlike anything you could have imagined in your wildest dreams. A journey that will take you to the very Kingdom of God and a relationship with your Heavenly Father that will grow so strong that you will feel Him at the very core of your being, heart and soul. Eva Peck will take your hand and guide you page by page, step by step to this priceless Pearl that Jesus Christ proclaimed – God’s peace that passes all understanding (Philippians 4:7). Eva Peck’s interesting and informative book, Jesus’ Gospel of God’s Love, presents a lot of material in such an abbreviated and simplified way that it does not overwhelm the reader. To me, this book can be compared to an artist drawing a picture that is a beautiful masterpiece. Eva’s unique background of having belonged to a non-traditional church, coupled with her theological education, as well as writing and editing skills – plus having experienced receiving the Pentecostal shower, has truly equipped her for such a time as this. This book is a perfect example of Eva’s ability and spiritual understanding to bridge the gap between the Divine Love community and those coming out of organized religion who can look up to and respect her and her work. I enjoyed the book. Feel free to add a comment or review on Amazon.